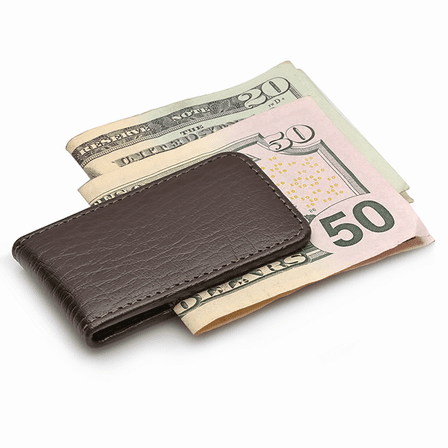 Compact and lightweight, the Classic Leather Magnetic Money Clip is great for taking along the essentials whether going out for a business lunch, date night, or weekend away! 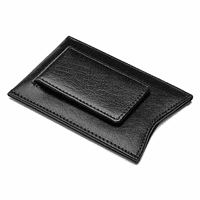 The money clip is top grain leather, in your choice of black or brown, and is stitched along all edges for durability and elegant style. Strong magnets hold from 10-15 bills securely in place. To add a custom touch to your gift, we will hot-stamp the front corner with 3 initials, and package the money clip in a gift box that's ready to present!. Dimensions: 3" x 1 3/4" x 1/3"
Sorry, the maximum we can do on this item is three initials. I would like to see a sample of what this looked like with initials on it. Its hard to imagine which way they go and how big they will be. We don't have that option right now for this product, sorry! The initials are embossed into the center of the wallet, each is about 1/4 inch high. Will this item demagnetize credit cards? No, the magnet is not nearly strong enough to demagnetize your credit cards. You would really need an industrial strength magnet for that to happen, many times stronger than the one used on this magnetic money clip. How does a magnetic money clip work? What do you mean by a magnetic money clip? There is a magnet inside the leather on both end of this money clip. You place the bills in the middle and the magnets stick together, holding your money between them. I hope that helps! Where can I find a sample of the personalization you can do on this item? If is "stamped" vs. stitched I am interested in seeing a sample before buying. Thanks. Please check out this item: http://www.executivegiftshoppe.com/401-5.html . the product pictures shows a sample of the hot stamping of letters. What does the money clip measure end to end in the closed position?thank you. It is 3" across when closed. Is there a limit to the number of letters that can be engraved? Thank you. Yes, we would usually not recommend more than 3 characters. Most people have their initials done. For the personalization, we hot stamp letters into the leather for a branding effect. What are the clip's measurements? We're so sorry, the black is out of stock! I want to order your personalized leather money clips but I want to make sure they can ship quickly. How long does the personalization take? The personalization does not add any time to your order. 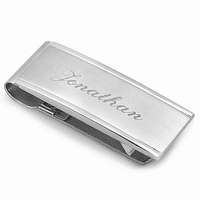 Personalized money clips and wallets ship the next business day after you order it. My husband loves it! Good quality for the price. My husband loves it. Good quality for the price. Initials are embedded into the leather, so they will last a long time. VERY SATISFIED AND EXCELLENT QUALITY. SPEEDY DELIVERY. THUMBS UP!!!! Magnet leak on this item, I found clip may hold 4-5 bills (folded). Found what I was looking for at Nordstroms. Great product and fast delivery!! Arrived in a timely manner...looks very nice...it's a gift so I'll not know how it works until he uses it. Happy with this company at this point. Just what I needed. It looks good and having my initials subtly embossed on it makes it even more special. Many compliments already received! This item not only looks good but it holds enough bills while not weighing down in your pocket. I had a few Q's before buying and the customer service dept. was very helpful and the item was at my house in no time. I was always skeptical about buying on the internet, I would buy from Executive Gift Shoppe again...quality, reasonable price, and timely delivery sums it up. My personalized magnetic money clip is exactly what I wanted. Quick turn-around time between placing the order and receiving the merchandise! I was very impressed by both the item and classy packaging. And the recipient of the gift was delighted! Will shop here again. The magnetic money clip is functioning as expected, I'm satisfied. ConsMagnets could be a bit stronger. The website was very easy to navigate and I received the item ahead of scheduled delivery. Disappointed the magnet was not strong enough to hold several bills. Will only hold in place maybe two to three bills! Got this for my son for his birthday. Better than the metal ones! Initials look good. Thank you Executive Gift Shoppe. ProsBetter fit in pocket than metal money clips. Ordered a few of these for graduation gifts. They' look great and the service was quick. 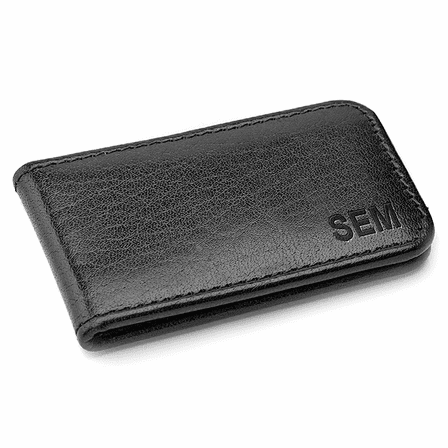 The leather is good quality, the magnet securely holds bills in place, the personalization could be a bit deeper on the leather but still looks good. Shipping was very fast. Pleased with this money clip. When my husband could not find his leather money clip which had been my father's for years. I decided to look online for a new one. I found the Executive Gift Shoppe and searched for the clip. They had what I was looking for plus a superman clip for our son. I had my husband's engraved. He is thrilled to have a new one even though he misses his father-in-love's aged leather clip! Thanks so much Executive Gift Shoppe for making it easy. This money clip is small and compact and holds my cash great. He wanted a money clip. Not a metal one because he's on the go too much and work would be rough on it. This is perfect! The leather is strong and the construction durable. The corners and design make it easy to have in your pocket and by worry about getting stabbed by it. 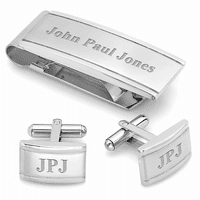 The engraving is well done and durable as well. Will last a long time. I bought this for my husband for Christmas and had his initials monogrammed on it. They came out beautifully. It came in a great gift box and arrived within a couple of days. Would not hesitate to use Executive Gift Shoppe again. Wish I had not personalized so I could return this item. ProsLooks attractive. That's about it. I had a magnetic bill holder for years and somehow lost it this past winter. I seen this one advertised and immediately hoped it would be a suitable replacement. Upon receipt I put it to use and haven't looked back. The magnet is sufficiently strong to hold and the overall size is perfect. i wouldn't hesitate to recommend this item to anyone interested in getting that hip bulge out of that back pocket. ProsThe right size and weight with a nice leather feel. Nice quality, great price, quick shipping. I liked it so much, I ordered another for my husband.